George Graham Reviews Carlo deLorenzi's "Four Seasons in One Recess"
Jazz-rock fusion had its heyday almost 40 years ago in the early to mid 1970s after a series of jazz musicians who had played in Miles Davis' bands, such as Chick Corea, John McLaughlin and Joe Zawinul formed their own groups. They played high-energy, high virtuosity, often high-volume music that did have the effect of turning a couple of generations of rock fans on to more traditional styles of jazz. By the late 1970s, many of the original players were losing interest in cranking up the volume, and others took fusion in various directions, from dance-oriented disco-influenced music to funk to what has become the jam band scene. Another offshoot, derived from the dance-leaning faction is what has come to be known as "smooth jazz." It has achieved a fair degree of commercial success but often not a lot of enthusiasm among jazz musicians and fans of mainstream jazz. This week we have a CD that comes up against the boundaries of "smooth jazz" but generally stays on the side of more conventional fusion, that is music with electric instrumentation that values the level of musicianship. 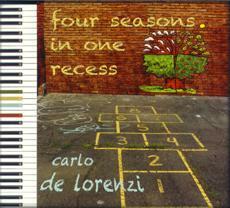 It's by Canadian keyboard player Carlo DeLorenzi, and he calls it Four Seasons in One Recess. Based in Toronto and northern Ontario, Carlo DeLorenzi has been performing for over 30 years, going back to his high school days. He has been in various bands north of the border, including Practical Blues and Compass Rose. The new CD has a variable cast of characters with two drummers and three different vocalists, even though this is a primarily instrumental recording. The music draws on various influences, including soul-fusion groups like the Crusaders, pop-jazz artists like Bob James, and instrumental soul groups like Booker T and the MGs. There are also hints of art rock, including some lyrics typical of the style. DeLorenzi's most frequent collaborator is guitarist Jason Sadites, who also engineered and mixed the recording. This is one those albums that seems at any minute to be in danger of falling into smooth jazz cliches. But it always pulls back from the brink and goes off in some interesting direction, and maintains its level of taste and some degree of understatement. The result is a very listenable album that could reach fans of the lighter stuff while still providing enough musical substance to keep satisfy those who dig the more serious fusion and jazz. DeLorenzi plays a variety of keyboards, and is multiply overdubbed on many tracks. While this could lead to one of those dreaded self-indulgent synthesizer and drum machine home-studio recordings, Four Seasons in One Recess goes someplace else with tasteful, well-recorded real drums, mostly played by Brendan Colameco. Canadian keyboard man and composer Carlo DeLorenzi's new CD Four Seasons in One Recess combines an easy going, approachable sound that skirts the light fusion and smooth jazz scene but generally provides more musical substance, with good compositions, tasteful musicianship and some creative eclecticism. With the varying personnel, there's a decent variety of sounds without its being too stylistically scattered. The CD also flows well from one track to the next, not that it makes much difference in a world of individually downloaded tracks. Our grade for sound quality is an A-minus. The instruments, especially the drums are well-recorded and have a nice clean, fairly punchy sound. Perhaps it was an effort to keep recording costs down, but the piano on the CD is not real. It's a close approximation from an electronic keyboard, but not the genuine article with all its subtleties. Carlo DeLorenzi revisits some areas that have been well-traveled and have seen their share of cliches. He manages to avoid most of them and make a worthwhile recording.